Excel spreadsheets, verbal pitches and typed-out business plans are not as effective as they could be in communicating the essence of a business model to investors, partners and staff? 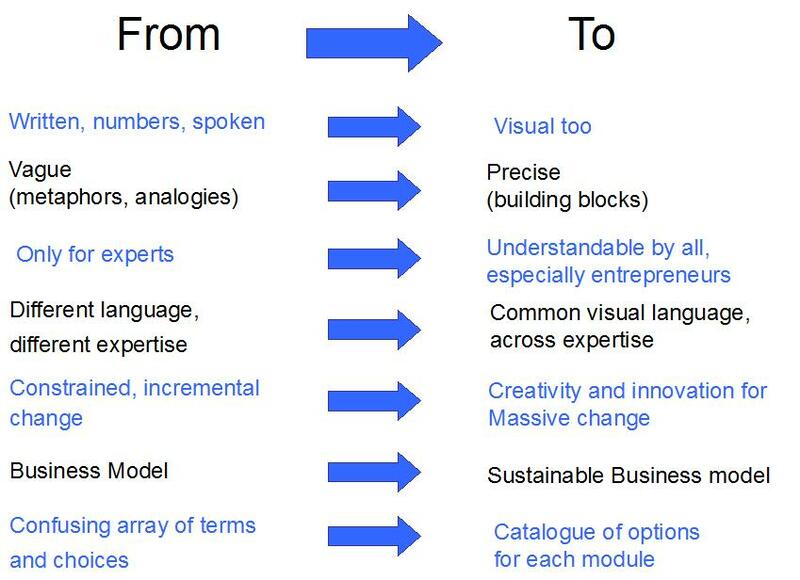 There is a confusing lack of a clear, consistent, modular ‘language’ for describing business models and the key components? Given that maps and models facilitate better thinking, play, prototyping and ultimately more effective outcomes in so many other fields, that perhaps there is something in that for business? That a ‘catalogue’ of options for different parts of a business, could assist entrepreneurs, advisors and those with resources (financial or otherwise) to innovate faster towards scalable social enterprises and more sustainable private businesses? I’ve heard and read much about innovating business models, including an IBM Global CEO survey 2006 that identified business model innovation as the new strategic differentiator. To be clear, ‘business models’ usually refer to the different relationships and flows of money and resources within a business. 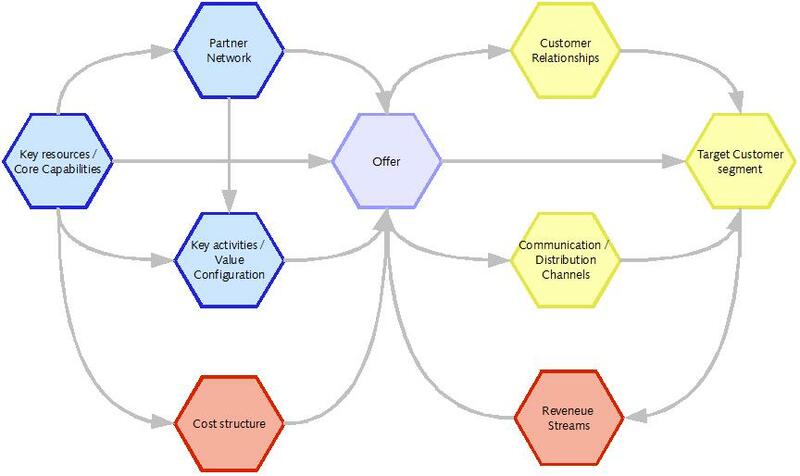 Any ‘business model’ usually aims to succinctly describe the logic at the heart of business: why it exists, what it does, and who for, how it ‘wins’ in its market, and the inputs, flows and outputs of operations. These are traditionally described in words (business plan) or in a spreadsheet full of numbers (financial forecasts, cashflow etc). Now, inspired by the work of Alex from Arvetica, I am developing a visual alternative. In one year’s time, entrepreneurs, advisers and funders in London (and elsewhere) find it easier and faster to design and communicate truly sustainable/social business models. In the longer term, businesses generally are better designed, and more successful (as measured economically, socially and ecologically). New social entrepreneurs are learn more quickly because there are many cases (presented in a consistent way) of what has and hasn’t worked in the past. Ultimately, that the transition from unsustainable to sustainable ways of creating and exchanging value in our society happens faster, for the benefit of individuals, communities and the earth. Case studies / documentation of different business models, within a visual and conceptual framework for representing how the parts of a business/enterprise relate. These ‘cases’ will show exactly how new sustainable models differ from old, and from each other. One-day workshop on October 7th to do some ‘live’ business model innovation, and co-create new social and sustainable business models. Sustainable Business Model Design Manual/Guide that entrepreneurs, advisers, funders, and existing organizations can use to learn about, advise on and choose the options in each area that are most appropriate for the context in which the enterprise/project will be created. Follow-up training sessions to share this manual / guide with other advisers and organizations that can use it themselves, and with their clients, partners, and funders. Software (either adapted or custom) that takes steps towards this tool being a functional model of the stocks and flows of money and resources in an organisation. Here is a short presentation to give you a taste of what I am working on. If you have any feedback, comments or ideas on how to take this forwad, it would be most welcome!